This story originally appeared in Bitcoin MagazineIssue 21. Art is an undeniable feature of society. They have always been a part of our humanity. Unlike sciences, which have predictable laws, art is human expression. Limitless, and inspirational. Art has the power to move humans into action… or inaction. Art can also be a commentary on our current human conditioning, leaving a mark on society. Yet these marks are largely funded and arguably controlled by the elite – wealthy families, foundations, and galleries – the ‘patrons of the arts.’ Artists must find a way to remain true to their forms of truth without offending those who put food in their mouths. Both Michelangelo Buonarroti and Pablo Picasso were backed by powerful patrons, yet simultaneously rebelled against the establishment: despite his patrons’ wishes to leave the Pieta unsigned, Michelangelo snuck into St. Peter’s Basilica and graffitied on the sculpture “Michelangelo Buonarroti, Florentine, made it.” And Picasso repeatedly offended his patrons through his crude paintings. Mark Rothko of the New York School, an artist who created works about despair and the human condition, defied what his critics and patrons defined as art, and ultimately took his life in a final snub to the establishment. The average salary for an artist in America is roughly $44,000 a year, a fact that challenges the concept of the modern-day ‘starving artist.’ Critics of this concept must still consider the immense expenses involved in the production of art; in fine art’s case, there’s the cost of materials, marketing, exhibitions, selling space, insurance, shipping, gallery fees and, of course, time. Then consider the costs associated with other forms of art, like dancing: shoes, training, costumes, travel… or music production and performance: instruments, equipment, audio engineering, performing… And then, of course, art is distributed through established platforms like iTunes and art galleries, which take 30% and 50%, respectively. What about government grants? Don’t governments provide financial resources – like grants – to aid artists and allow them to focus full-time on their art? These grants are both slow to award funding and, depending on the government in power, funding is often taken away from art styles that those in power deem ‘inappropriate’ and undeserving of government funds. In Canada, Bill C-10 included a provision that would allow the government to refuse tax credits to film and television productions that are ‘contrary to public policy’. What does that include, really? Who defines public policy? Unfortunately, when you’re giving out the money, you make the rules. For reasons like this, it is argued that a separation between Art and State must exist. Without it, pure, creative art cannot flourish. But artists need the funding to even produce. So what are their options, here? Right now, artists are stuck. It seems like they can only exist in the physical space by taking funding from their patrons. Otherwise, they flock to the internet, where they may access more funding, but the experience of their art is diminished. 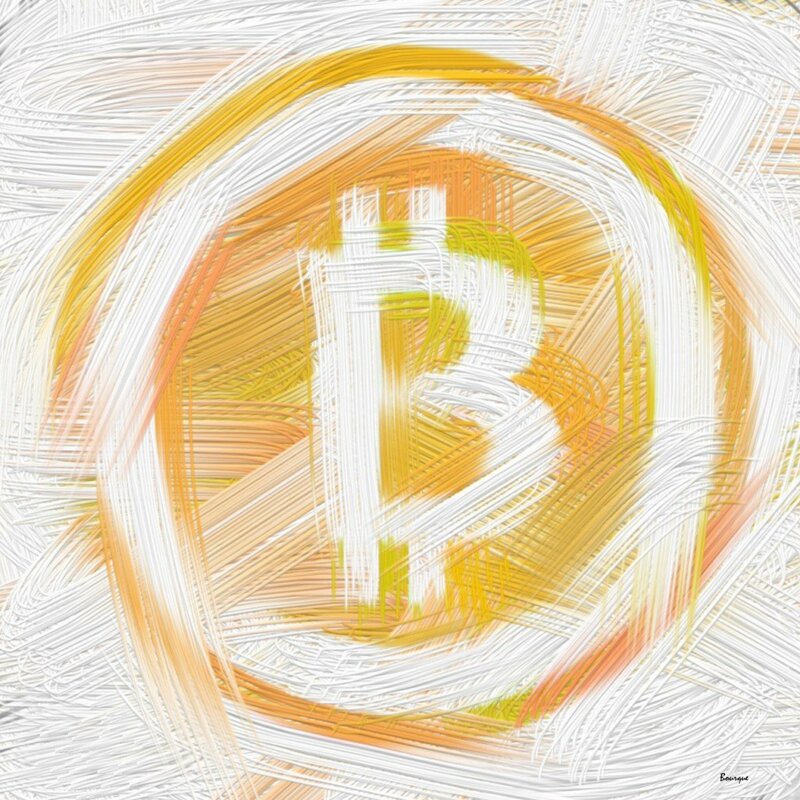 A new option presents itself with the emergence of Bitcoin – one that combines the digital world with the physical world, one that could allow artists to stay in the expensive in-person world of galleries without relying on the restrictive demands of modern day patrons. The fact that we can now move small amounts of money around – a phenomenon called ‘social tipping’ – may tip the scales in favour of artists. We – ‘the people’ – may now be able to collectively fund our artists! Right now, we cannot tip artists $1, because it would cost $1.50 in fees through Interac e-money transfer, and we would need their e-mail address, a password, etc. And we can’t pay them through credit card. What would that look like, traveling from painting to painting and swiping our card for $.25 for every piece we like? Bitcoin changes this. Now we can use our phones to scan a unique code and send small payments directly to the artists whose work we enjoy. Social tipping is already alive and well with regards to online content and on Twitter. In his most recent interview with Joe Rogan, Bitcoin evangelist and expert Andreas Antonopoulos discusses his experience with being tipped on the popular social platform: “I take tips on twitter. And without knowing these people, they can send me a quarter, or ten cents, over Twitter. Instantly. and you can’t even do that with any other payment system because it costs so much…” We saw the power of this when Joe Rogan flashed his wallet’s QR code, and the tips started pouring in. Can this integration of QR codes, facilitating micropayments, change the funding of artwork and keep it in the physical sphere so we can experience it? Can we remove art from the hands of the elite and fund artists – through the volume of small payments or ‘tips’ – and have the masses fund them? Or is this just a dream? If we do start incorporating QR codes on our art, will this lead to us putting QR codes on everything, thus monetizing our human experience? Peeke acknowledges that the territory is new and evolving, but “supports options for artists to make a profit from their work and seek monetary support, even from people who cannot afford to purchase the work.” As long as social tipping does not remove the eventual purchase of the work, or detract from the experience of it, Peeke appears encouraging. This feedback is positive, and offers a win-win-win: people can enjoy the artwork, the artist can create two streams of revenue, and the gallery still gets paid for their efforts. Currently, artists around the world are attracted to the promises of Bitcoin. Like art, the protocol transcends borders. Fearow worked with Ukrainian artist Alexander Fedosov to create the debut images for Cryptoart. Cryptoart publishes aesthetic paper wallets that function as a double-investment: a purchase that allows bitcoin to appreciate along with the art it is stored in. Theoretically, bitcoin acts as a deflationary currency and store of value, and art is typically the same, seeing its value increase over time. This combination – a cryptocertificate – offers investors a recession-proof investment that both looks amazing and retains value on two levels. The aesthetic paper wallet hosts a QR code on the back – offering a way for visitors or onlookers to transfer value to the art-bearer’s wallet. The cover of this magazine is a social experiment into the power of QR codes and art: if you enjoy the cover, tip Alexander Fedosov and let him know. In this work, Fedosov portrays the ancient greek goddess Hecate, which throughout history has been associated with crossroads. It’s meant to allegorize Ukraine as it’s forced to choose between western and eastern worlds. Fedosov is particularly affected, as he is in close proximity to Russian forces. Can we use micropayments to change the ‘starving artist’ problem? It appears that bitcoin offers us a way to socially fund our artists, removing their reliance on governments and the financial elite. This could be a chance to bring the ‘power back to the people’ and allow us to support artistic aspects of our culture. Can this bring the power back to the people and support the artistic aspect of our cultures? We bitcoiners have already shown the world how we collectively can transform charitable attempts and injustices, as shown through our support of Sean’s Outpost and Dorian Nakamoto. Can we transform art, too?